Have you ever cooked a recipe that calls for buttermilk? What do you do if you don’t have any? Check out this easy trick to substitute for buttermilk. Lots of recipes call for just a little bit of buttermilk. But I haven’t found a way to buy just 1 cup of buttermilk at a time. In my grocery stores I can either buy a quart or a half gallon. And sometimes I just don’t plan ahead, and decide on the spur of the moment that I want pancakes for breakfast one weekend morning. So what can you do? Rush out to the store to buy too much buttermilk? Nope! 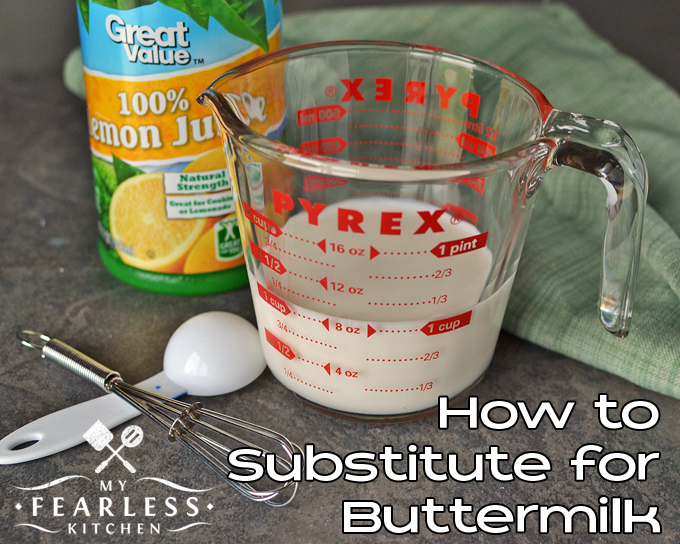 Use this easy trick to make a substitute for buttermilk at home! Buttermilk is basically soured milk. And you can do that at home, if you need to. All you need is a little bit of lemon juice and some milk. When I’m baking (which is when I usually use buttermilk), I like to use whole milk. Use a glass measuring cup. Put 1 tablespoon of lemon juice into the measuring cup. Then fill the cup up to the 1-cup mark with milk (it will be 1 Tablespoon less than 1 cup of milk). Give it a good stir, and let it sit for 5 minutes. There you have it, 1 cup of soured milk, to use in place of buttermilk! Use this up right away. If you have any extra, just toss it. It won’t keep well. If you need more than 1 cup, just double the recipe. 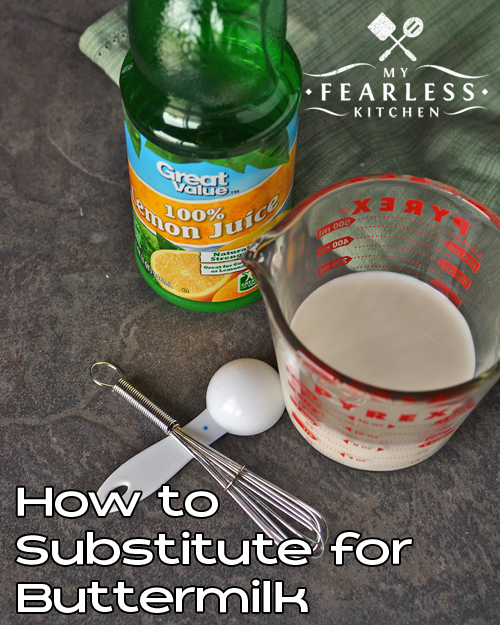 Use 2 Tablespoons of lemon juice, then fill your measuring cup up to the 2-cup mark with milk. It’s as easy as that! What do you like to make with buttermilk? Have you ever cooked a recipe that calls for buttermilk? What do you do if you don't have any? Check out this easy trick to substitute for buttermilk. Place 1 Tablespoon lemon juice in a glass measuring cup. Fill the cup up to the 1-cup mark with whole milk. Stir well. Hi! Can I try this recipe with rice or almond milk? Hm… I’m not sure. The lemon juice actually makes cow’s milk go sour, like buttermilk. I’m not sure if it would react the same way with rice or almond milk. I haven’t used them before. If you do try it, please let me know how it turns out! Does this work with skim milk too? I haven’t tried it with evaporated milk. It should work… but I would test it out before you commit to using it in a recipe.